Posted in: shadow. 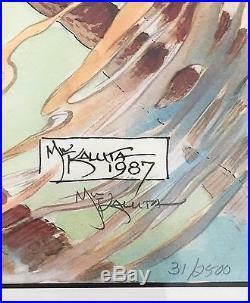 Tagged: ablaze, framed, kaluta, lithograph, mike, print, shadow, signed. 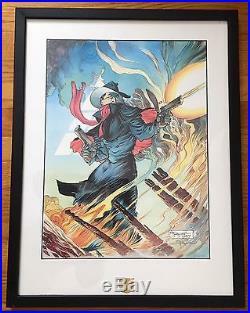 For sale from First Team Press in 1987 is THE SHADOW ABLAZE, a 17″ x 23″ lithograph print of the pulp magazine hero signed by the artist, MIKE KALUTA. This print, #31 in a limited edition of only 2500, is professionally framed under UV protective glass. 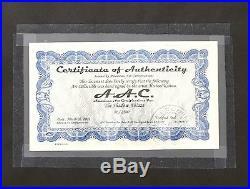 A Certificate of Authenticity for the autograph is taped in a plastic pocket to the back of the frame. The item “THE SHADOW ABLAZE Framed Lithograph Print Signed Mike Kaluta 1987 COA #31/2500″ is in sale since Thursday, March 16, 2017. This item is in the category “Collectibles\Comics\Posters”. The seller is “jerrystheman” and is located in Olney, Maryland. This item can be shipped worldwide.